V242: 1790s Robe Royaliste: Almost Done! 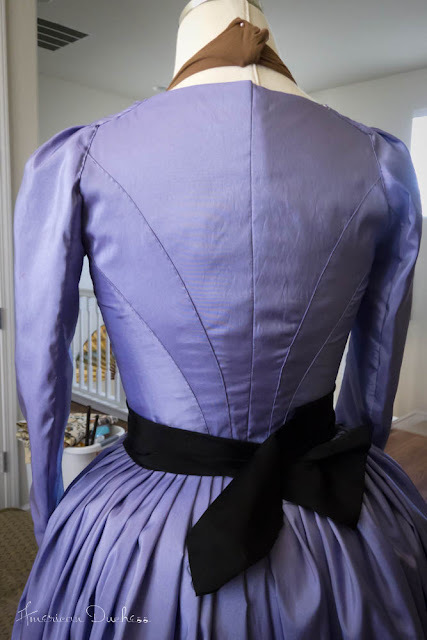 I had intended to bust out this giant purple chemise style gown quickly, but then between being mad sick and then lazy, it's taken me *this* long to get it done! And it's still not done! I still need to do the button loops and attach the self-covered buttons at the corners of the front piece. I also need to make a proper sash and acquire one very large black hat, complete with very large black feathers. The gathered front bust is *huge*, very puffy, very giant-1790s-puff. The design of the back came from the green/gold gaulle in The Duchess. The construction of this gown wasn't so bad - at least it didn't come out horribly short-waisted this time. I did have issue with my sleeves, as usual, and there was fiddlage with the center back seam and shoulder strap placement, also as usual. For a first go at a gaulle, though, and a test for a future gown made in silk, I'm really quite happy with how this monstrosity has turned out. The sleeves were troublesome - they didn't come out with the fullness like in The Duchess, but there is a little pleating. 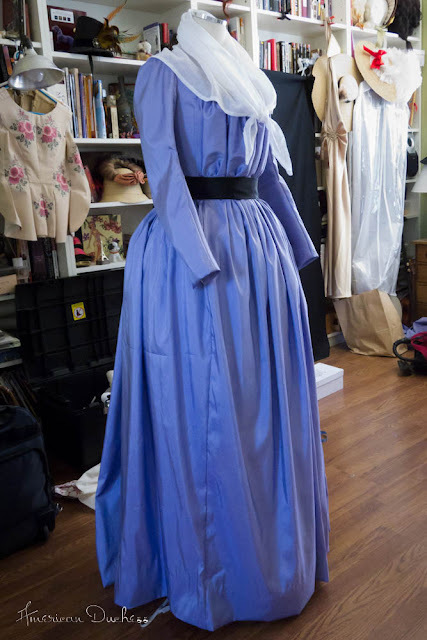 I set them the 18th century way with the top-stitched shoulder strap. beautiful! and in such a striking color! I love the seam lines on the back of the bodice, very dramatic! Beautiful! I'm also in love with the lines on the back. And your cute little hand stitches! 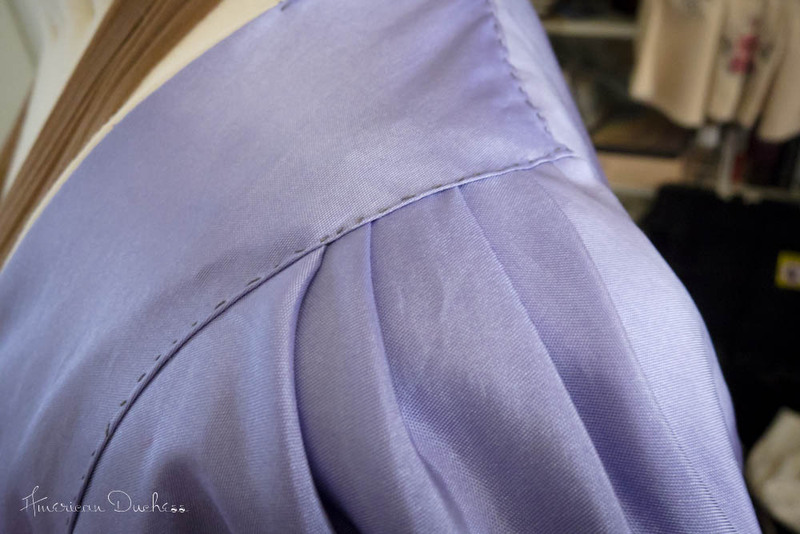 I am in LOVE with the seam lines on the back of the bodice. LOVE. I love the seams on the back! The dress looks great. Ooh, it's so pretty! I love the back and envy the fit of it because I've been trying to fit my mock-up for a new anglaise for days and still it doesn't seem to be right on the back side. *sigh* I guess I need to make a thrid mock-up version, then. I've never had so much trouble with fitting and I don't really know what is wrong with it this time. Beautiful dress......especially love the color. Interesting! I love that back construction. Can't wait to see a photoshoot of it worn. 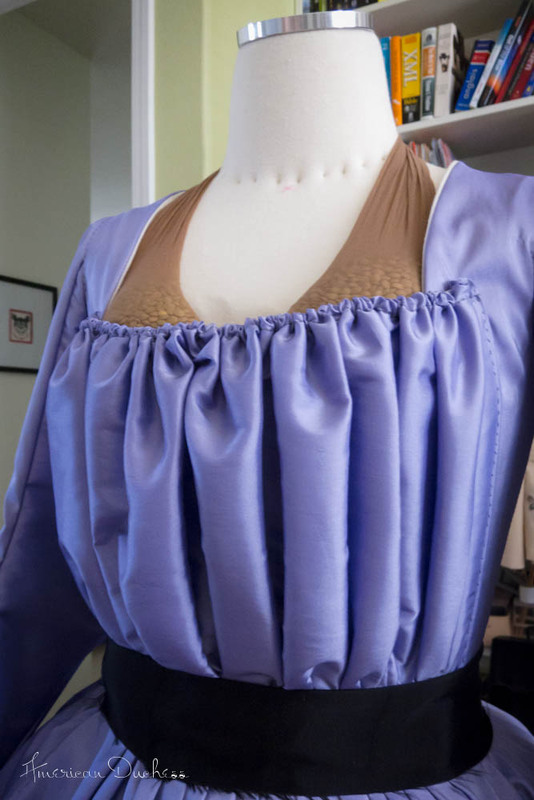 As many have said before me,I adore that bodice! I love the puffy front and then the structured back...Stunning! Perfect color for it as well. I'm commenting kinda late so you probably won't see this comment, but just wanted to say that this looks very beautiful and I hope we will get to see it worn soon!